The fundamental reason so many markets are not free, and so dysfunctional, is that the voters of our democracy don't really want freedom. Freedom will come when we want it, when we insist on it, when the average voter sees a free market solution rather than endless controls as the answer to real world problems. The sad paradox of free markets is that free markets do not need people to understand them to work. But democracy does require voters to understand how things work. In that vein today's internet browsing (both HT marginal revolution) brings good news and bad news. Good news - one more piece of evidence that people from left and right are finally beginning to see the huge damage of zoning and construction restrictions, including inequality, income segregation, and perpetuation of economic status. That "progressives" now see this too is a most heartening development. Today's data point is What Happened to the American Boomtown, in, yes, the New York Times. The piece notices the dramatic expansions that Chicago and San Francisco experienced in the 19th century, when they were economic magnets. "Chicago in 1850 was a muddy frontier town of barely 30,000 people. Within two decades, it was 10 times that size. Within another two decades, that number had tripled. By 1910, Chicago — hog butcher for the world, headquarters of Montgomery Ward, the nerve center of the nation’s rail network — had more than two million residents. ... It was a classic metropolitan magnet, attracting anyone in need of a job or a raise. But ...migration patterns like the one that fed Chicago have broken down in today’s America....local economic booms no longer create boomtowns in America. The places that are booming in size [sunbelt, providing cheap housing] aren’t the economic boomtowns — the regions with the greatest prosperity and highest productivity. 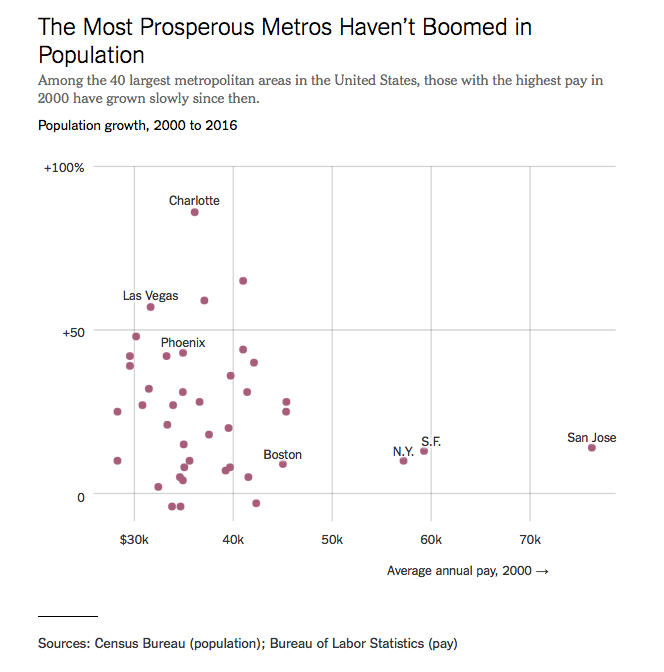 In theory, we’d expect those metros, like the Bay Area, Boston and New York, to be rapidly expanding, as people move from regions with high unemployment and meager wages to those with high salaries and strong job markets. Some people aren’t moving into wealthy regions because they’re stuck in struggling ones. They have houses they can’t sell or government benefits they don’t want to lose. But the larger problem is that they’re blocked from moving to prosperous places by the shortage and cost of housing there. And that’s a deliberate decision these wealthy regions have made in opposing more housing construction, a prerequisite to make room for more people. Moreover, she gets not only the overall flow but its character -- lower income people move out to make room for the very high skill migrants who can pay outrageous prices to be in the high productivity clusters. This results in inequality and residential segregation. As a result [of restrictions], housing prices have soared in the most prosperous places, making them inaccessible to lower-income workers and negating much of the allure of the higher wages there. Over this same time, ...high-skilled migrants have clustered in these areas, while low-skilled workers have been more likely to move elsewhere. For a Times article, the omissions are just as instructive. No mention of big housing subsidies, and "affordable" housing mandates (which drive up the cost of market rate housing even more.) We just need to get out of the way and allow more housing. In the Boston suburbs, the Bay Area, Brooklyn and Washington, people who already live there have balked at new housing for people who don’t. Now the question -- are these voters just somewhat hypocritically voting their interest, or does it reveal that that average voter doesn't get how markets work? But perhaps people just don't understand the basics of how markets work. Evidence for this proposition comes from our second MR link of the day, "Upset about the I-66 tolls?" in the Washington Post. Several Virginia lawmakers are calling on the state to suspend tolls on Interstate 66, condemning this week’s variable tolls that hit as high as $40 as “outrageous” and “unacceptable”. “The tolls on I-66 are outrageous,” Wexton tweeted Tuesday. “$30+ tolls are unfair, especially for those of us with limited east-west travel options. I wonder what the solution will be. Magic? Building more highways? With what money? You pay with tolls or you pay with taxes. And, then, restore the previous rush-hour traffic jams. The week 1 quiz in econ 101 is, what happens if you reduce the toll to a "fair" amount? And the answer is, I-66 looks like the 405. It does not occur to anyone that you're really not paying the government. You are paying your fellow drivers to stay home, carpool, come later, so that they will get out of your way and let you sail to work. The reaction to Uber surge pricing is a similar test. Economists love it. You mean rather than sit in the rain and wait, I can pay more, compensate someone else for waiting, encourage a driver to skip dinner, and take me where I want to go, now? I'm in. Or, I can save some money and go later. Everyone else hates it. And gets cities to ban it. And we go back to waiting. The sad paradox of free markets is that free markets do not need people to understand them to work. But democracy does require voters to understand how things work. Are people are upset about toll rates that they consider unfair? There's no point in scolding them for being human. The way forward is to put more science into our policy-making, by turning to Chicago Booth scholars like Richard Thaler. It may be too late to reform the thinking of other leaders of the profession, but award committees are intervening and helping to steer the profession in a productive direction. I-66 can never be a true market, it is the feeder for the DC bureaucrat. Whatever the price, prime time on the route is pre-allocated to members of central government. I think the normal policy is to tax Kentucky and use the proceeds to supplement toll charges for the federal bureaucrat. Zurich has successfully been following a policy of densification (increasing its population density by relaxing zoning restrictions) for many years, letting people live closer to where they work. This policy has regularly been confirmed by public votes, so I would not be so cynical about democracy. In my opinion, the regular public votes have lead to better decision taking, as they helped stopping a number of ill-conceived and overly costly projects the city proposed (somehow politicians tend to like those). Nice post...worth pondering: we hear a lot of jibber-jabber about "labor shortages." For large sections of the country, are labor shortages really housing shortages? It sure is in my small county in the mid-west. We could put several hundred people to work here today but we can't get them here because of a lack of housing. It is zoning, here the cost is driven up buy all kinds of requirements that drive up the cost of the shelter to no good purpose. We had a similar reaction to toll lanes in Atlanta. I85 was heavily congested during rush hour. Prices are higher during peak and lower otherwise. Those lanes are almost always filled and the state is building more in response to public consumer request. Rent controls are a killer as well. In the late 80's, developers bought rental property in Hoboken and Jersey City. They bought tenants out and converted those 500 sq ft units to condos. Today, one of those shoe boxes trade for 300k to 400K. No increase in housing stock! Add on: the solution to tight housing markets is the abolition of property zoning. But when it comes to their own neighborhood, every influential person is pink. Do you want 40-story condos across the street from your single-family house, with ground-floor retail? Hugo is one of the very few HRC district Republicans to have survived the 2017 Dem wave. Had the Dems in VA taken every HRC district, they'd be calling the shots in the House of Delegates. Of course he'd move to the left to benefit his liberal constituents. "The reaction to Uber surge pricing is a similar test. Economists love it." "So what are the drivers doing in response? Gaming the system by tricking the algorithm." "The researchers report that drivers organize mass switch-offs. The dearth of drivers in a given area then triggers the surge pricing mechanism." "Drivers are also revolting against UberPool, the customer option of sharing a ride with other passengers at a discounted price. Infuriatingly, it has been the default on my own Uber app more often than not, despite my never once having wanted to use it. But it turns out to be extremely unpopular with drivers too, who get a much lower commission on UberPool rides, according to the researchers." You do not want free markets you want competitive markets. Crony capitalism is something not to desire! I would be interested to know how a truly "free" market would be crony? The promise of free markets with no barriers to entry / exit and no "stifling government regulations" is that suppliers of goods will compete to increase margins by increasing their productivity. There are obvious constraints in terms of Uber drivers - number #1 being safety. I doubt you see any Uber drivers in two seater Formula 1 cars driving 250 MPH down the street. Another way that Uber drivers can increase their margins is by colluding together on price. Is this crony capitalism? Not really. This is more like cartel action. The policy conversation needs to move from "what is important" to "what is more important". When resources are limited, its not really about identifying important goals, it's about prioritizing them. Is it "important" that people be able to afford the road? Yes. Is it *more* important than clearing up travel? This is a much better question. Here, in California, we AIMED at the housing shortage. Over thirty years ago the various cities adopted "greenlines" to prohibit urban sprawl. The land area for development became fixed. Gee golly, the demand for housing did not. More people on less land equals higher costs for those land resources. To compound the problem, those same cities demanded higher impact fees, higher density and the associated costs of those types of structures, restricting infrastructure capacities to limit the overall growth to whatever the growth caps were...and voila...a housing shortage. Now, the politicians are all complaining about the cost of housing...and doubling down and making market rate pay for the cost of creating "affordable" housing. They act ignorant as to the cause...ummm...policy, housing policy. Besides zoning and housing restrictions, certification of barbers and hair-weavers is hampering the economy. We face a steady drum beat from the media about the benefits of regulations but if we look hard we would find that in areas that have been deregulated, the consumers have been the big winners. I shudder to think what we would be paying for phones if still under government regulation or what airline tickets would cost. We see Uber and Lyft successfully competing against government regulated taxis. Many professional licences do more to protect existing professionals than the public. We can only dream of the benefits if we ended our socialized school systems. The media, bureaucrats and politicians stand in the way of a free market that benefits the consumers. I would love to see a study that shows convinces me that deregulation was the dominate factor in changing prices in these industries. I have the belief that technological innovation was already decreasing costs in these industries. As anecdotal evidence of this I offer this statement, there are several state sponsored airlines around the globe and they are still able to compete. The fact is, both of these industries were nascent in both their technology and their development before deregulation. Furthermore, if Aviation was a completely free market passengers would be in trouble. Passengers would have to foot the bill for the whole aviation system (Airports, security, air traffic control). Yes they pay some fees now, but no where near what is costs to run the system. Additionally, I don't know that Boeing would exist without the support they receive from the federal government. You still need the private competition to create the incentive to innovate and adopt technology. Great article. John is right at the epicenter of it, Palo Alto. My wife and I were there a few weekends ago. There is an old dirt track from a defunct, closed high school where the land would sell for 5 million or more if someone could build multi-story on it. I'm sure no more than 10 people a week run on it. So what would it take to make real estate prices reasonable in northern california. Manhattan like density from Marin to Santa Cruz? So, please show me how Houston has less inequality, income segregation, and perpetuation of economic status. I don't quite understand the pressure to have high density. 200 years ago, to function, you *had* to be in the city core since communication was limited to face to face (and snail mail). Twenty to thirty-five years ago (that's a generation, folks) we had Interstate highways, the Internet, and the cell phone. So why the insistence upon living one on top of another? My own guess is that our economy is much more complexly inter-related than we know, much more competitive (and therefor much more responsive to even minuscule competitive advantages), and mediated communication is still much more attenuated than face-to-face. So we still need to be within walking distance of each other. I live in downtown San Jose and can speak first hand on this issue, voters do not understand how free markets work. The reason there has been an increase in jobs in San Jose is because it is in the heart of the Silicone Valley, thus making a central hub for people who dream in working at the next big Tech company. Freeways here are ridiculously packed at all hours of the day, but the solution so far has been the expanding VTA and BART public transportation system. The BART is now being built to extend to San Jose, most likely because of how you mentioned that since this is the heart of the Silicone Valley more people are migrating here for work. People cannot afford to live in San Jose because of sky rocketing housing prices making a dilapidated 2 bedroom house worth an easy million dollars. No average earning person can afford to live here and most of them do not understand which way they should vote to solve this issue. John says democracy requires voters to understand how things work. But what if voters don't know how ballots are "used to defeat the franchise", and generations of us have been misled about how two party political systems prevail?